Design improvements to replacement parts, such as steel pistons, can lead to longer service life. 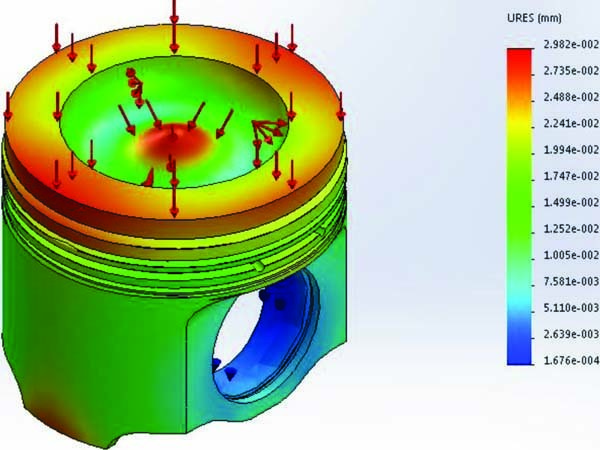 Here, Industrial Parts Depot uses finite element analysis (FEA) of a steel piston to ensure manufacturability of a high-quality part. Photo courtesy of Industrial Parts Depot, Torrance, California. Branded replacement parts manufacturers are increasingly functioning like OEMs in their approach to quality control, utilization of sophisticated measurement systems, and adoption of lean manufacturing techniques to produce consistent, high-quality parts. This article was contributed by Industrial Parts Depot, Torrance, California. Over the past few decades, the acceptance of replacement parts suppliers for engines used in the power generation market has evolved significantly. Today, the consistent quality, availability, coverage, and warranty of products from branded aftermarket suppliers are increasingly rivaling those of their OEM counterparts. Those attributes are often particularly essential when it comes to parts—whether OEM or branded aftermarket—for servicing gensets that supply primary or standby electric power, or are integrated with UPS systems. For example, a wide variety of industrial users require gensets for power at construction sites, mining and military operations, and offshore oil rigs. On-time production and worker safety at these types of facilities is highly dependent on the reliable availability of electric power. Many industrial users rely on gensets to provide standby power, which may be critical to continuing production, and to keep costly equipment running during blackouts. Others may use natural gas or diesel-generated power to provide electric energy as an alternative to grid power during specific hours in order to avoid high “peak” energy costs. In some applications, gensets are integrated with an uninterruptible power source, or supply (UPS), to provide extended backup capability. These may include data centers, healthcare facilities, and pharmaceutical labs, where continuing patient procedures, maintaining critical temperature ranges, or preventing data losses are critical concerns. The trend toward using branded aftermarket parts suppliers to maintain gensets and many other heavy-duty applications has resulted largely from the ability of some of these suppliers to deliver high-quality parts on time at competitive or even lower price points. In fact, many leading branded aftermarket suppliers are increasingly functioning like OEMs, adopting advanced manufacturing and quality assurance programs, incorporating lean manufacturing techniques, or offering products individually, as well as in kits and sets, to facilitate engine overhauls. ot only are these aftermarket suppliers meeting stringent OEM tolerances, but in some instances, they are also providing value-added marketing and customer support services, providing excellent availability, comprehensive warranties, and even parts research capabilities. Such value-added services are increasingly convincing heavy-duty users, parts resellers, and service shops to source replacement parts from aftermarket suppliers. Quality Diesel Service, of Amelia, Louisiana, was one of the nation’s first independent diesel shops to offer 24/7 parts and service for Caterpillar engines to the oilfield industry. “We know time is money in the oil industry, so we stock one of the largest inventories of Cat® application replacement parts and remanufactured engines in our market,” said Vincent Bourgeois, parts manager for Quality Diesel Service. Since 1987, Quality Diesel Service has provided its Caterpillar customers with parts from a branded aftermarket supplier of parts that are equivalent and interchangeable with OEM parts. 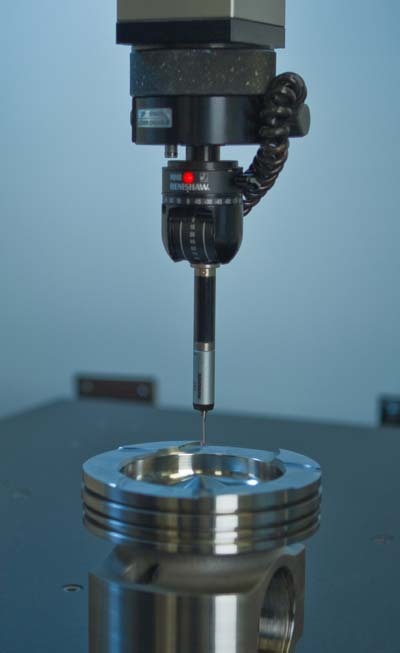 Aftermarket suppliers are increasingly using advanced measurement systems, such as this coordinate measuring machine (CMM), to meet stringent OEM tolerances. Photo courtesy of Industrial Parts Depot, Torrance, Calif. Many users and service providers say that the advanced manufacturing and quality assurance capabilities of aftermarket suppliers have made them comparable to OEMs in terms of quality, while offering the advantage of highly competitive prices. “I think an aftermarket company like Industrial Parts Depot, for example, has to prove themselves, so that’s why they go the extra step to make sure the product is right,” Bourgeois said. Industrial Parts Depot (IPD; www.ipdparts.com), headquartered in Torrance, California, manufactures and distributes a broad range of replacement parts for Caterpillar, Cummins, Detroit Diesel, Volvo, and Waukesha engines. Such parts include pistons, cylinder liners, valve train parts, engine bearings, and gaskets. Quality Diesel Service sources a range of parts from this supplier, including high-mortality items such as wear parts, including pistons, liners, bearings, gasket kits, and seals. While quality and availability are essential to meeting Bourgeois’s requirements, he said that a somewhat lower price and comprehensive warranty are a “plus” influence on his choosing them. He also said that this supplier has made some design improvements to replacement parts, such as pistons. These changes can lead to improved service life, he said. Diesel Exchange Incorporated, a Springfield, Missouri-based remanufacturer of diesel engines, also uses branded aftermarket engine parts on a selected basis. For the past six years, those have included various Caterpillar models. Among the users of gensets are customers in the construction, military, and oil and gas industries. For those and other Cat applications, Diesel Exchange has sourced parts such as cylinder kits, bearings, and gasket kits. According to Steve Hendrick, president of Diesel Exchange, this line provides the same quality and availability of the OEM dealer, yet also saves on costs. Other diesel genset service providers, particularly machine shops, are more aware of the manufacturing capabilities of this manufacturer. In some cases, such suppliers also provide valuable technical services, such as answering questions about issues such as parts interchangeability. Some aftermarket suppliers achieve brand name acceptance through quality that results from incorporating innovative methods on the production line. Some companies have completely redesigned their steel piston and cylinder liner production processes, incorporating lean manufacturing concepts and new production methods that ensure consistent quality, speed production throughput, and enable cost savings. “All of this is aimed at providing end users with highly reliable products at a very competitive price,” said Airton Martins, IPD’s vice president of operations. The company’s production line uses not only state-of-the-art equipment, such as specialty 4-axis CNC machines, tools, and advanced quality assurance instrumentation, but also employs unique production methods that provide vital product attributes, such as consistent concentricity among functional features. For example, many suppliers manufacture pistons using separate machining operations—one for the crown area, one for grooves, one for final skirt outside diameter, and so on. Martins said that this several-step process invites concentricity and balance problems. To avoid such issues, his production line performs all cutting operations in a single load to improve product quality, and is accomplished with specialized clamping fixtures that are specially designed for each product, fabricated in-house, and updated in case of product running change. The company also incorporates in-process quality control with custom-designed “universal gaging stations” at each operation in its steel piston production line, requiring all features to be checked 100 percent within machining cycle time without affecting productivity. “In some cases, up to six gaging stations measure critical dimensions, such as concentricity, groove locations, overall height, and final weight,” Martins said. Also, to confirm the accuracy of the gaging stations on the steel piston line, Martins requires that finished products be inspected at specified intervals in the quality assurance lab, using advanced measuring instruments. “All of this is part of our lean enterprise program,” Martins said. “This program optimizes production, reduces waste, minimizes work-in-progress and labor, and provides tremendous overall quality improvement.” Martins also noted that the company shares production processes improvement concepts with suppliers, helping them improve and maintain consistent quality and control costs. Will branded aftermarket suppliers continue to push the boundaries to ensure they have comparable product? It’s surely a trend worth watching. Get the manufacturing industry news and features you need for free in a format you like.